I like the stairs. I had to first look where is the blue. Gah, I love ombre! I love that banister. And that light. And that pale blue Eames rocker. Nice round-up, Nina! It certainly reminds me of the beach too, for some reason. I'm not going to the shore this weekend either, but I'm definitely planning on enjoying the nice weather. Seriously, I cannot stop staring at all that ombre. I'm with onshore- loving the ombre spindles. Javier is on a mission to hit the beach every weekend. As you know, it's not exactly around the corner from where we are- so we'll see how successful he'll be. The banisters are pretty awesome. The beach near us is gross honestly - but maybe I'll have to search for a deep blue sea this summer. I'm not generally a huge fan of ombre, but you've made me fall in love with your choices here. They feel so beachy, and that will always make me happy! Love your choices. They do feel light and summery to me. We won't be hitting the beach either this weekend. It's actually pretty cool here. Have a really great weekend, Nina! 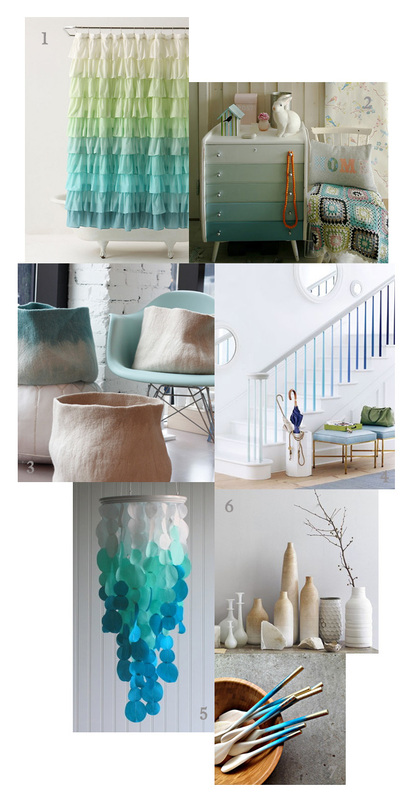 I looooooove the ombre stair uprights (looks like a DIY one day!) I keep seeing the ombre dresser .. maybe it's a sign for me to diy mine!!! :) I was hoping to head to the pool this weekend, but rain came (boohoo). As for the beach, hubby and i just booked our vaca for this year ... on the beach of Aruba (im so excited!!! ).